"It is only with hindsight that the unimaginable now seems possible." Many of the papers carry the statement from the family of Marie Conlon, the pensioner whose body was only recently discovered in a west Belfast flat, more than two years after she died. Her siblings said they were "shocked and heartbroken" by the death of the 68-year-old, who was "much loved by her family". "She was a very independent person," the statement continued. "Numerous attempts had been made to contact her in person, and by other means over the course of the past two years but at no point were suspicions raised she had been deceased." The Daily Mirror spoke to Sinn Féin councillor Stephen Magennis, a cousin of Ms Conlon's. 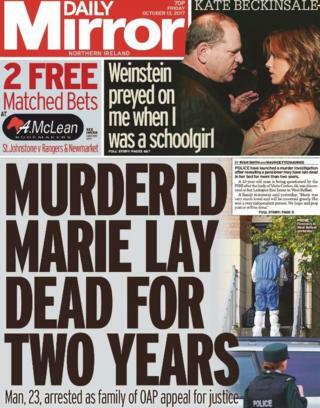 "It's difficult enough that Marie's been found dead, but for the family to be told she may have been murdered. On top of that hearing she may have been dead for two years," he said. "Marie was a very private person and they're a private family so this is a lot to take in." The Belfast Telegraph spoke to neighbours in the "tiny" Larkspur Rise housing development and found some "close to tears" and "feeling physically sick" at the "grim secret". One resident said the flats where the body was found "have very transitory populations". "Residents are always coming and going," she added. Another resident said Ms Conlon's death had left her feeling "deeply unsettled and fearful in her own home". The Irish News says what happened at Larkspur Rise "raises serious questions about care of the elderly in modern times". "As we enter the cold, winter months, it may serve as a reminder to us all to check on those most vulnerable members of our community," the paper says. A 23-year-old man has since been charged with several offences related to theft, fraud, burglary and preventing the lawful burial of a body. Another tragic story which makes all the papers is that of Natasha Carruthers, who died in a car crash in County Fermanagh over the weekend. The launch of a murder investigation into the 23-year-old's death "has heaped heartache upon heartache" on her grieving family, reports the Belfast Telegraph. 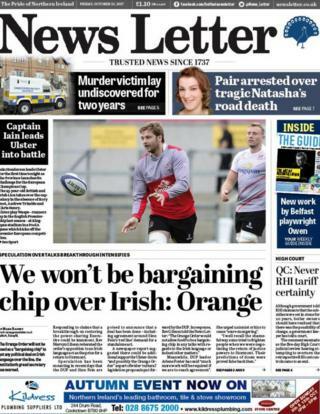 The News Letter's front page is dedicated to the Orange Order and its insistence that it will not be used as a "bargaining chip to get a political deal on Irish language over the line". The institution's grand secretary was responding to claims that a breakthrough on restoring the power-sharing executive at Stormont could be imminent and speculation that there could be "additional support for Ulster-Scots and possibly the Orange Order" as part of the language deal. But DUP leader Arlene Foster said "substantial issues remain to be resolved and much more work will be required if we are to reach agreement". The Newsletter also has the story of Tyler McLean, the Northern Irish man shot dead outside a nightclub in Toronto, Canada, last week. The paper says the 25-year-old, who had been working as a nightclub promoter, was to travel home the following day to begin work at his father's technology company in Newry. Canadian media outlets are reporting that an altercation took place before the shooting. The Irish News is waxing lyrical about a so-called poetry jukebox, which has been installed outside the Crescent Arts Centre in Belfast. Resembling a ship's periscope, the jukebox contains 20 works written by living Irish writers and most are reading their own works. Organisers want to "put poetry where it belongs: everywhere, for everyone" and it is hoped passer-bys will pause, take a breath and drink in some words. The Daily Mirror says make the most of the "pleasant weather" this weekend as it won't last. Northern Ireland is expected to be battered by the remnants of Hurricane Ophelia on Monday, with heavy rain and wind speeds of 60-70mph. The newspaper reminds readers that it will coincide with the 30th anniversary of the Great Storm, whose existence was notoriously denied by BBC weather Michael Fish. "We've been warned, so have time to batten down the hatches," the paper's editorial says. "Things will get very stormy if the authorities try to pretend they were caught on the hop by Ophelia."